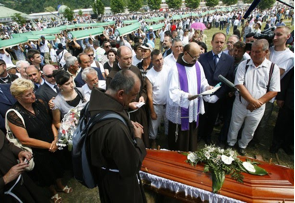 BOSNIA – On the 15th anniversary of Srebrenica (July 11, 2010), one Bosnian Catholic was finally laid to rest, a victim of the 1995 Srebrenica genocide. 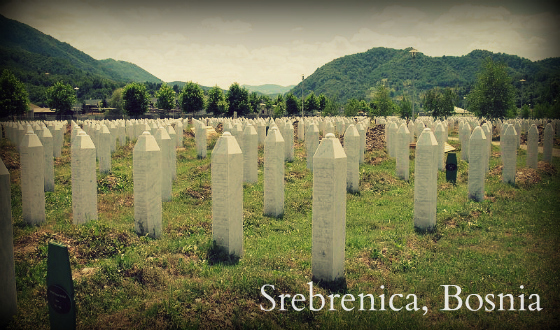 Rudolf Hren was born in Vrbas, Serbia, but lived in Srebrenica before and during the war. He was buried among his Muslim friends with a Christian (Catholic) insignia marking his grave. “Rudolf is buried among the friends he stayed with until the last day,” said his mother Barbara Hren. Her other son Ivan was also killed in Srebrenica. He died in 1992, and the last time she saw Rudolf was July 10, 1995. Fifteen years later, Rudolf’s body was identified in a mass grave near Srebrenica. With the support of Rudolf’s wife Hatidža and daughter Dijana, Barbara decided that Rudolf should be buried at the Memorial center in Potočari near Srebrenica among his Muslim friends with whom he lived and died. Rudolf moved from Serbia when he was three months old because his parents got a job at a lead mine. While his wife and daughter now live in Tuzla, his mother Barbara returned to Srebrenica a few years ago and lives alone on her floor. No one wants to return to Srebrenica.